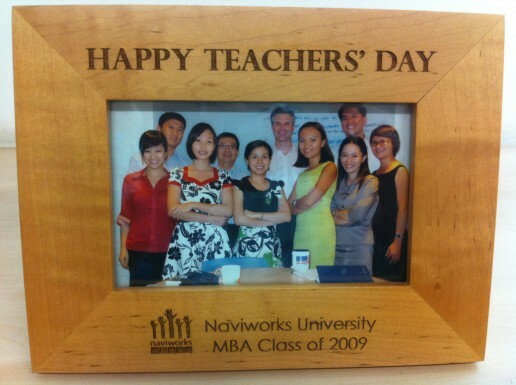 The NaviWorks MBA Class of 2009 surprised me with a cool gift for Teachers' Day. I believe in constant learning and improvement. If you’re not learning, you’re stagnating and dying. LEADERS are responsible for creating a học hỏi environment and ensuring the rate of change on the inside is greater than that on the outside. I had an experience about three years ago that shot home this learning to me. I had asked Chi, our Marketing Manager, to do a survey of our main competitors. I wanted to know about their products, prices, sales positioning, number of jobs, job-posting policies etc. Chi listened intently and nodded smartly. “You’ll have it next week,” she promised. We went on for several more pages before I interrupted her. Chi looked a bit sheepish, aware something was wrong, but she wasn’t quite sure what. It surprised me. Chi is exceptionally talented, smart and motivated. I didn’t get it. Chi and I spent the next hour and a half discussing the data she had collected, what it implied about our competitors’ strategies, what it meant for our business and how we might respond to strengthen our position. Chi was quick on the uptake and rapidly grasped principles like competitive positioning and differentiation strategy. She gushed with enthusiasm. I decided then and there to begin teaching critical business analysis skills to all our leaders. A few weeks later I started what I call my “MBA Class.” I download Harvard Business School cases, assign as homework, and run a two-hour class every other week. I conduct the class in American business school style, asking all students to prepare the case ahead of time and come prepared to advocate a point of view about what the protagonist in the case should do. We also relate the lessons in each case to our own business. And yes, we do begin class with a cold call. Our “rate of change” has tripled. And our leaders are having a lot more fun. What are YOU doing to create a “học hỏi” environment in your company? Dear anh, I call what you have created, the MBA class, the NAME competition, the “hoc hoi” environment, and many other cool stuff at Naviworks… “cool management”. They are really cool :) I’ve already got a collection of it, like “cool survey” (a tool to know what your ‘people’ say about you- what’s important is how you use it), “melon market” (where everyone is encouraged to sell their ideas and you might also get ‘complaints’ from here), etc. will share them with you soon. Anyway, what I’ve learnt from this post is “the rate of change”… it’s another way to say how you create your own learning curve, isn’t it? But I like this term, “the rate of change on the inside…” It emphasizes on changes. And about changes or “hoc hoi”, if you want to raise it in your company, you’ve got to work on individuals I think. Like when you define “communication”, you say that you cannot just give someone the company compliance notebook and expect them to understand what it is (or at least to read it). Now you work with each person about what they want to find out a “catalyst” that make them “hoc hoi”… Yay… a lot of time to spend… I guess you’d say, “spending time talking with your staff, what else would you do, ‘cos that’s your daily task?” Would you say that? Thanks for this posting.. Thanks Nga for the compliment! Yes, learning and improving, both yourself and your people, is what leaders do. After all, the ability of the leader is a limit on the ability of the team. The leader must improve himself/herself at the same time he/she works to improve the team. It takes lots of time, sure, but there is glory in the hard things. I completely agree with this. Not only good for the company now but also will pay big dividends in the future. Having in your network the future leaders/experts is really amazing. When you help people succeed, they will not forget it. Thanks for the comment, Mto! I saw you at HR Day 2011. I like your idea about building Learning culture. So do I with my company. I know, the recruitment market is very hot now, especially in head hunter area. And I have some solutions to help Vietnamwork become Good to Great in this market. I have read Vietnamwork’s hand note provided at HR Day 2011, there are something could be better. And I aslo have met Ms. Chi sometimes. I see she have not enough vision and capability to talk more with me about these. So, I decide to connect with you. If you want to “học hỏi”, I am ready to meet you. Thanks for the comment. I’d love to hear your ideas about how we can improve at VietnamWorks. Please email me your thoughts at christopher.harvey[at]gmail[dot]com. We can set up a time to meet too. By the way I like your blog!